Widely renowned artist Jan Blomqvist will bring his fusion of genre-crossing sounds to all corners of the globe this year. 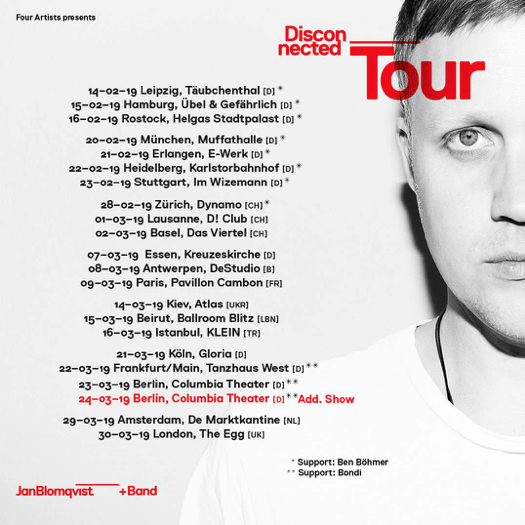 Starting with a European tour for his recent album ‘Disconnected’, Jan will be playing several shows with his band, as well as, solo DJ sets across the continent. Kicking things off in Germany, where Jan usually bases himself in the capital city of Berlin, Jan will soon move into Switzerland, Spain, Belgium, France and Ukraine, before dates in Lebanon, Turkey, Amsterdam and London next month. Following the European tour, Jan will be heading across the pond for a string of solo gigs including the esteemed Coachella Festival and Art With Me Festival in Coachella. An innovative artist, Jan was one of the first producers to bring techno into the concert realm. Leading a band consisting of Christian Dammann (drummer), Felix Lehman (pianist) and Ryan Mathiesen (lyricist), the concert shows also include a light and visual show for a fully immersive experience. 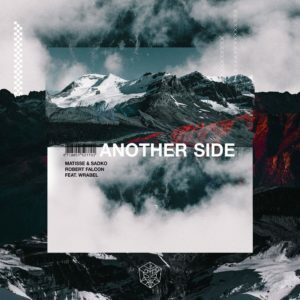 Inspired initially by the punk movement during his adolescent years, Jan soon found his passion switch to the electronic movement, enjoying a variety of previous releases on Armada Deep; the sibling label to Dutch giant Armin van Buuren’s iconic imprint. With his ‘Disconnected’ album focusing on the constant connection of ‘the Facebook generation’, Jan’s production was the subject of widespread acclaim on account of his thought-provoking lyrics and rich, rhythmic melodies. Touring across various cities over the next two months, tickets for Jan Blomqvist’s Disconnected tour are on sale now and can be purchased here. Tour Dates: 14.02. Germany | Leipzig – Täubchenthal 15.02. Germany | Hamburg – Übel & Gefährlich 16.02. Germany | Rostock – Helgas Stadtpalast 20.02. Germany | München – Muffathalle 21.02. Germany | Erlangen – E-Werk 22.02. Germany | Heidelberg – Karlstorbahnhof 23.02. Germany | Stuttgart – Im Wizemann 28.02. Switzerland | Zürich – Dynamo 01.03. Switzerland | Lausanne – D! Club 02.03. Switzerland | Basel – Das Viertel 03.03. Spain | Madrid – Afterbrunch @ Las Ventas Plaza de Tor 07.03. Germany | Essen – Kreuzeskirche 08.03. Belgium | Antwerpen – DeStudio 09.03. France | Paris – Pavillon Cambon 14.03. Ukraine | Kiev – Atlas 15.03. Lebanon | Beirut – Ballroom Blitz 16.03. Turkey | Istanbul – Klein 20.03. Switzerland | Arosa – Arosa Electronica 21.03. Germany | Köln – Gloria 22.03. Germany | Frankfurt/Main – Tanzhaus West 23.03. Germany | Berlin – Columbia Theater 24.03. Germany | Berlin – Columbia Theater 29.03. Netherlands | Amsterdam – De Marktkantine 30.03. United Kingdom | London – The Egg 14.04. USA | Indio – Coachella Festival 21.04. USA | Indio – Coachella Festival 27.04. Mexico | Tulum – Art With Me Festival 12.05. USA | San Antonio Recreation Area, CA – Lighting In A Bottle.